My memories from Provence are vivid, and at least for now, all from summertime travels there. They are mostly memories of the Luberon, with its old stones, castles and hilltop villages. 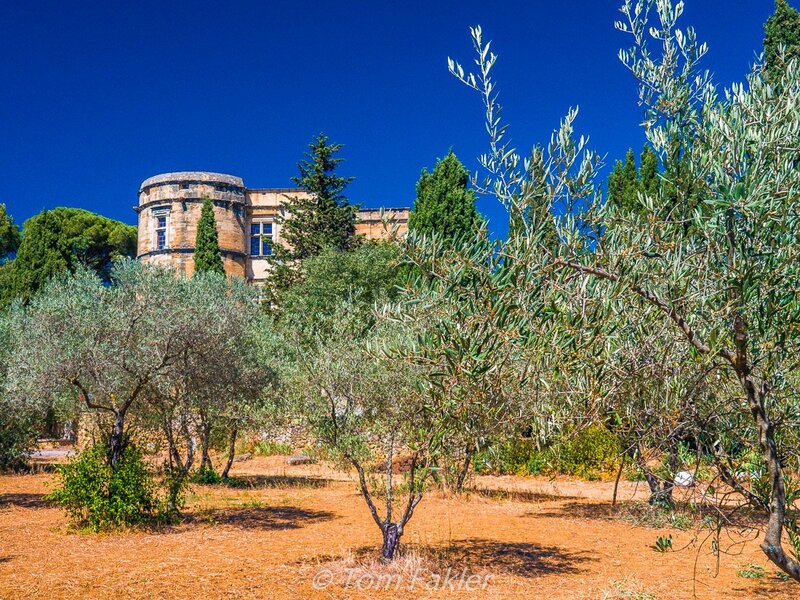 Provence is bathed in marvelous light in summer, and offers eye candy for the soul. That same light feeds the vineyards and fields of the region, producing local color that is literally good enough to eat. Last July, during a week’s travel with Wendy Jaeger of Bliss Travels, Tom and I experienced aromas and flavors that will forever remind us of Provence, and especially, the Luberon. We tasted wine in a cave under a castle, in a gallery filled with beautiful pictures, and in a shady hilltop grove on a hillside speckled with stone bories. We sampled seasonal produce, charcuterie and cheeses in regional markets. We had a four-course gourmet meal centered around the melons of Cavaillon. We enjoyed simpler fare in rustic settings, prepared by the owner-chefs who hosted us. The Luberon comes to life in lavender sachets and glasses of the rosé wine for which the region is legend. It creates flavor memories as friends gather around tables under the shade of ancient trees, and spend hours together over Sunday lunch. The pace of daily life in the Luberon is slower than we are accustomed to, and after a few days, the city dweller’s need for bustle fades. Time here is for savoring age-old culinary traditions and for enjoying the lilting exchange of pleasantries in country markets. In the tiny family-owned shops and restaurants of Luberon, purchases are still weighed on traditional spring-balance scales and lovingly wrapped in paper for carrying home. 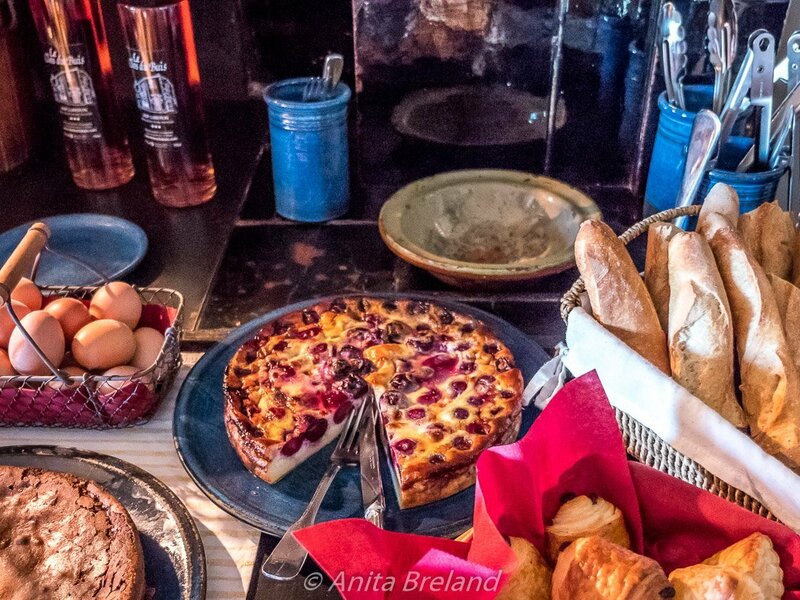 Here then, in a virtual wrapper, are eleven of my favorite flavor memories from Provence. 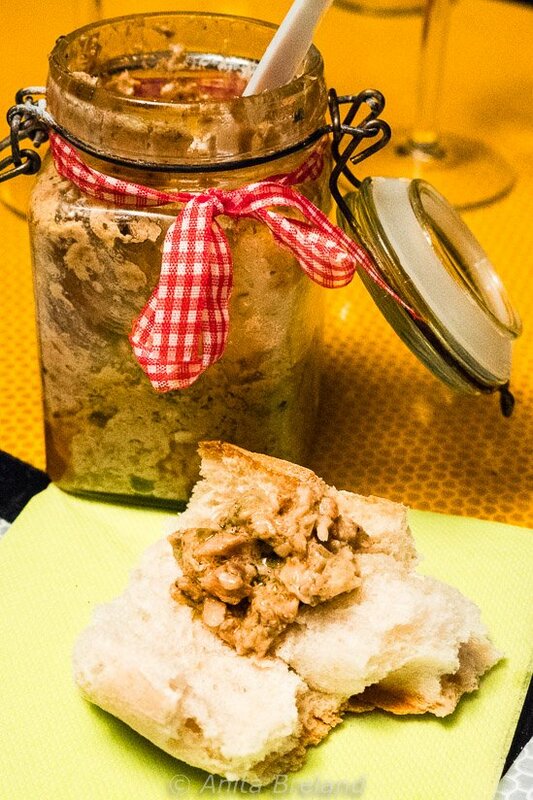 Rillettes of sardines (pictured above) was just one of the dishes served at a wine tasting in Lourmarin. A heady blend of fish, capers, preserved lemons and other good things, it was a standout. I’ve made a version of it since returning home–not an exact match, but pretty darned good. Seasonal fruits at their peak, especially peaches and cherries, got my attention in the markets, when vendors offered us samples that dripped, and streaked the pavement profusely, with every luscious bite. Fruit was a recurring theme at mealtimes, too. My hands-down favorite, though, appeared on the buffet table several mornings. Not overly sweet, our breakfast clafouti popped with flavorful cherries. Clafouti for breakfast! One of my favorite desserts is also a great way to start the day. 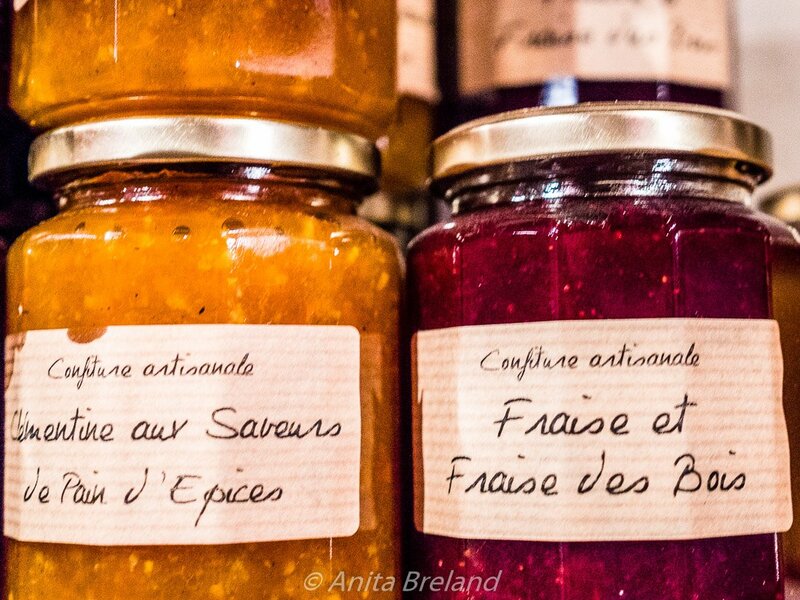 Myriad artisanal jams and jellies line the shelves of wine caves and little mom-and-pop groceries in the Luberon. They soon became taste memories from Provence, as well. I brought several jars home with me, including one spiked with lavender. We enjoyed Sunday lunch with Wendy, four courses and a three-hour gabfest at a country restaurant surrounded by nature. After a tray of starters (peas with mint, lentils with shallot, aioli vegetables, mushroom toast and tuna blended with creme fraiche, it was on to mains–beef daube with walnuts, leg of lamb, or trout almondine)–with sides. Then came Banon cheese, salad and flourless chocolate cake with creme Anglais. After lunch, we took a nature walk, another French tradition. For more, see our “Sunday lunch” photo story. 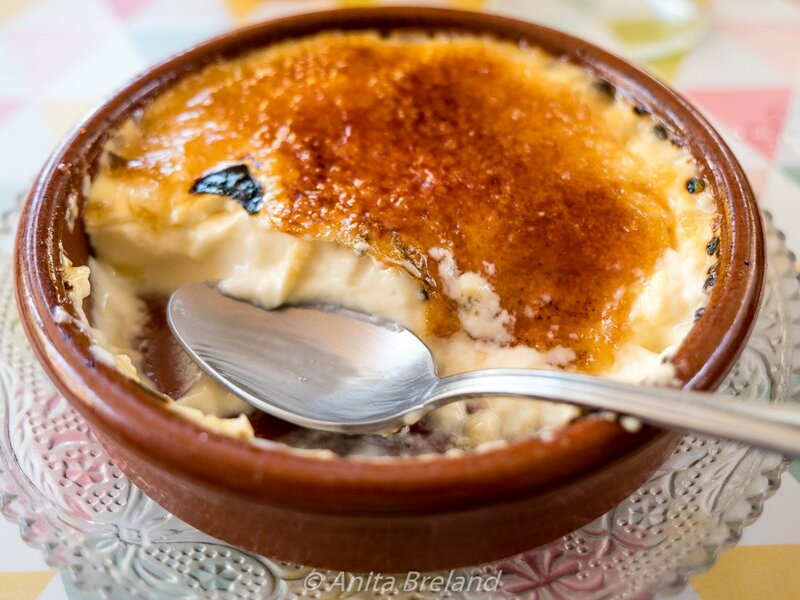 There are versions of creme brulée in many cuisines, and I love them all. The contrasts in texture, the burnt caramel on top, the sweet magic of the custard. A mid-summer Luberon treat is creme brulée flavored with lavender, and I thought it was splendid. If you like lavender, you will like our Steller story about lavender! At the Apt market, the queue for Banon cheese was long (this was before our Sunday lunch). I soon learned why. My new favorite, this is a goat cheese rubbed with pepper and soaked in eau de vie. Each cheese round is then wrapped in dried cedar leaves, tied with a raffia ribbon and ripened in a stone jar. Magnifique! 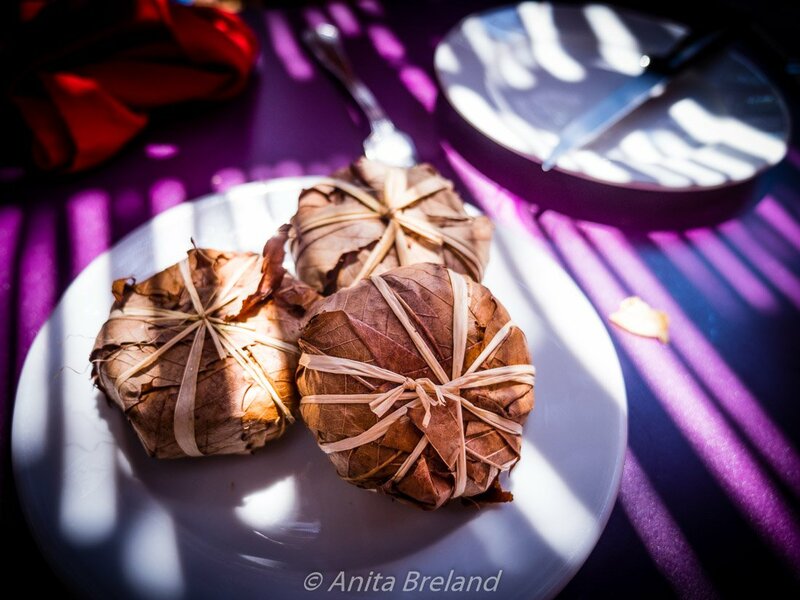 Meltingly ripe Banon cheese, served in its wrapper of cedar leaves. Some of the best olives anywhere come from this part of the world. 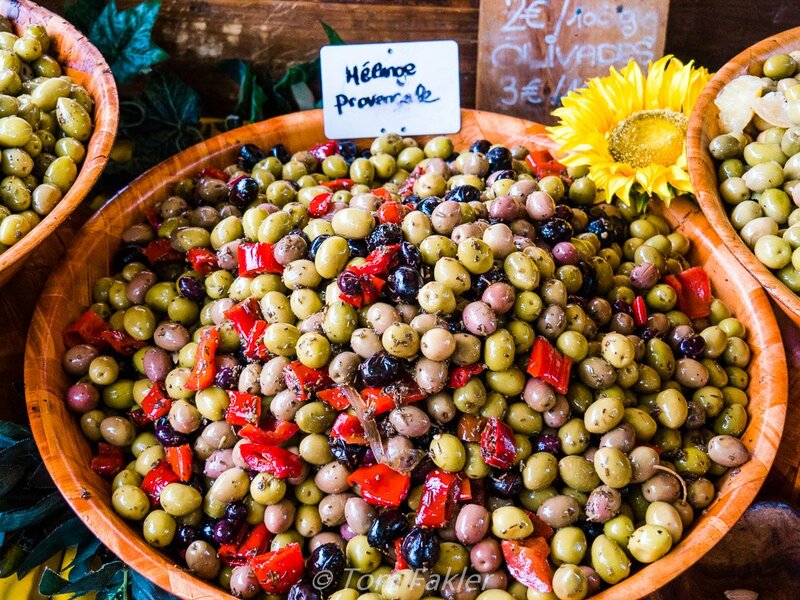 It’s the way they are marinated and dressed that sets them apart , and makes Provençal olives one of my favorite nibbles. 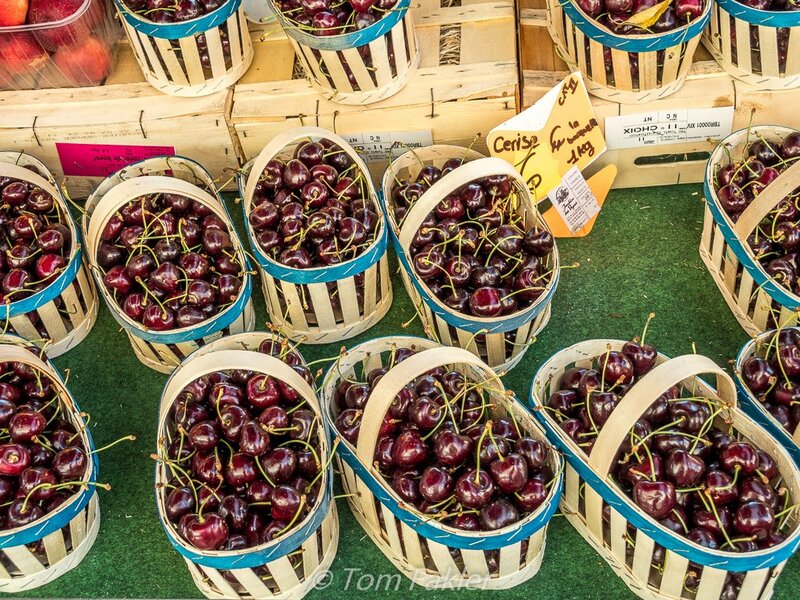 I liked that they were on every table, but especially that we got to try so many in the country markets of the Luberon. 9. Provençal Onion Tart (Pissaladière) is flavored with anchovy paste and black olives and set atop a thin pastry crust. The combination of sweet, caramelized onions and pungent flavors is irresistible! 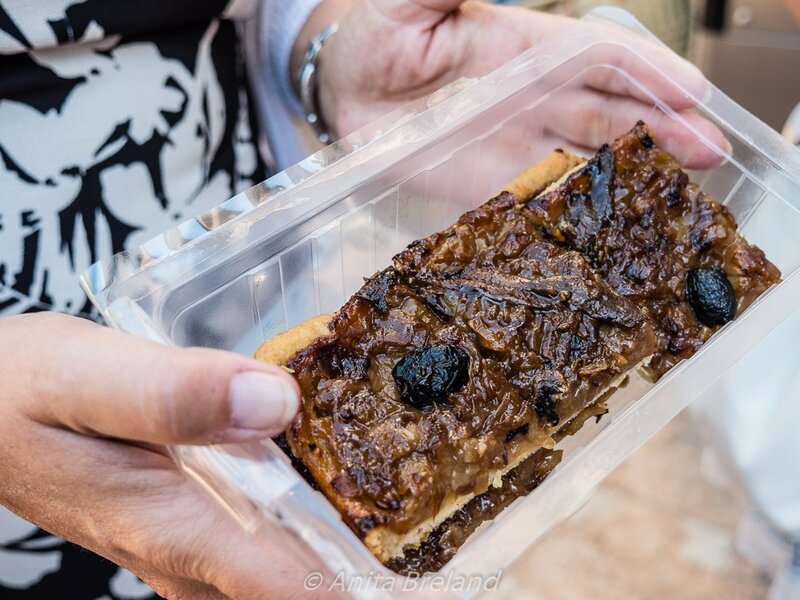 Market summer take-out: Provençal Onion Tart (Pissaladière) flavored with anchovy paste and black olives. 10. On the last day of our trip, we were treated to a wine-tasting in an art gallery. Wendy, who teaches and writes about wine, had selected a range of wine types for us to try. 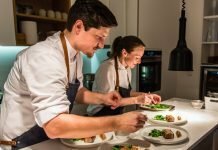 Surrounded by the fine art photography of Provence-based Esther Sobin, we tucked a succession of dishes from local Chef Celine Ramillon, served tapas-style. Stay tuned for more from this memorable event! 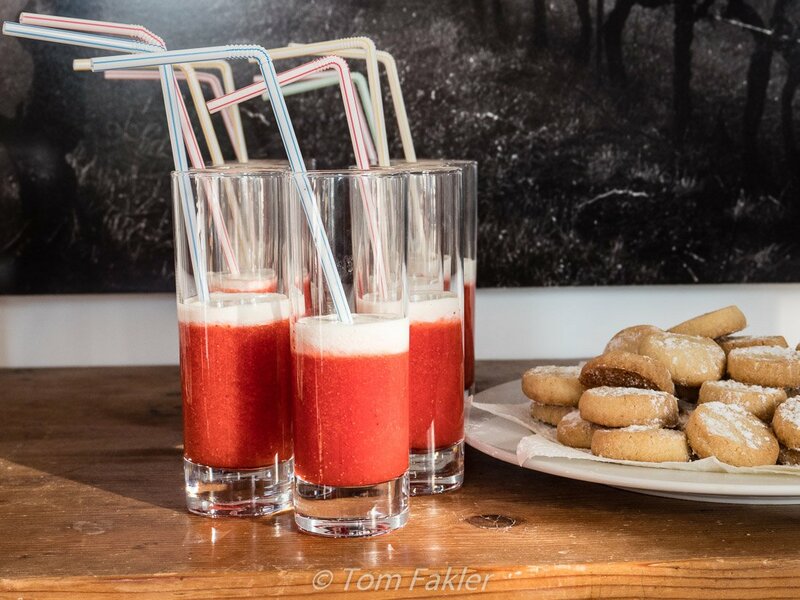 Wine tasting in an art gallery finished with homemade shortbread cookies and a strawberry cappuccino. 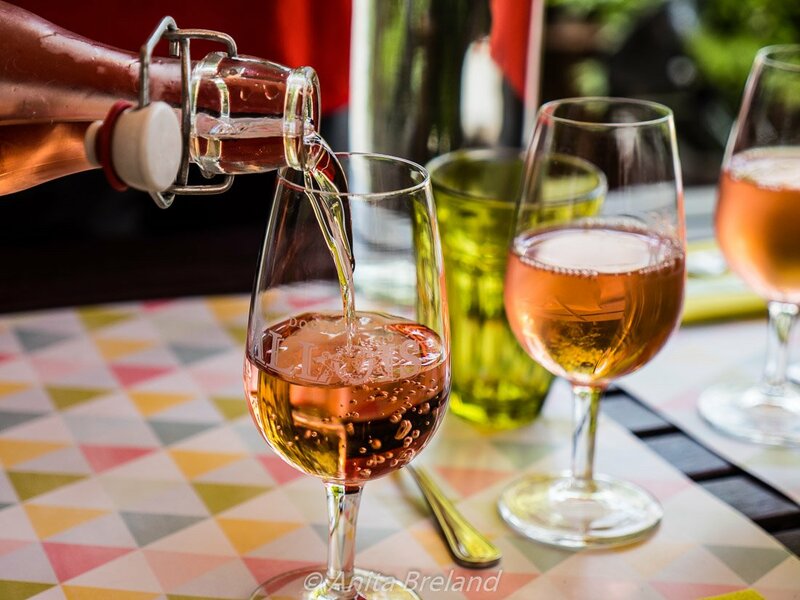 Throughout our stay, we gloried to fine Provençal rosé wines and tried many of them. From a glass of Chateau La Canorgue on our first aperitif evening to award-winning Les Safres and Orphea regional wines, our memories from Provence include the varied styles of rosé produced in the region and a bit further afield. Rosé wines of Provence: light, dry and perfect for summer. We were in Luberon last summer as guests of Bliss Travels, who offers culinary and wine adventures in France and Italy several times a year. 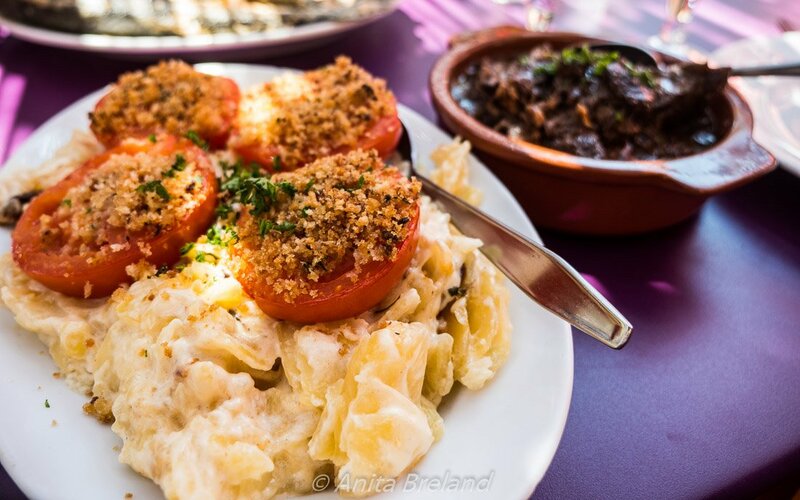 Travelers with Bliss can be assured of personalized itineraries with plenty of opportunities to taste the best seasonal foods.